IN CHARLOTTESVILLE, Virginia theatre-goers attend on-Grounds productions at UVA by the Virginia Players and the Heritage Theatre Festival or performances by the Four County Players and the Light Opera Society. Music-lovers look forward to UVA’s Tuesday Evening Concert series or concerts by local bands and symphony orchestras. University students, community members of all ages and visitors to the area enjoy fine art from around the world at the permanent galleries and special exhibitions at the University of Virginia Art Museum and private galleries on the Downtown Mall. 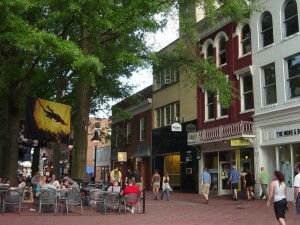 The city also supports a number of art venues and 25 movie theatres. The area celebrates Spring with a Dogwood Festival and Parade every April, highlighted by blooming azaleas, dogwood and redbud trees. The Virginia Festival of the Book, which brings together readers, editors, publishers, and writers from around the country for lectures, seminars, and discussions about literature, poetry, and nonfiction, also occurs in spring. Summer events include the weekly after-work celebration — Fridays After Five — a lively concert series at the grassy amphitheatre at the western end of the historic downtown mall. Summer also brings a Fourth of July celebration at Monticello, Thomas Jefferson’s beautiful estate. Fall brings regional fairs to the area, wine tasting tours, and breathtaking scenic drives through the Blue Ridge Mountains to view the instensely colorful foliage. Every Winter brings “First Night Virginia”‘s New Year’s Eve family-friendly festivities, featuring live music, entertainment, and fireworks at midnight on the mall. Join us!